The Eden district in central Cumbria begins at Durham county border and covers an area from Hesket and Ainstable in the north to Tebay, Ravenstonedale and Mallerstang in the south and westward it takes in Patterdale, Threlkeld, Mungrisdale and Castle Sowerby. Part of the Lake District National Park also comes within Eden district. The Eden Valley is a much quieter area of Cumbria with its traditional towns and pubs, beautiful hamlets and sandstone villages some dating back to Viking times, lush green countryside and dramatic landscapes. The valley is unspoiled by industry and lies between the Lake District to the west and the Pennines to the east and the Howgill Fells to the south. Eden is excellent for walking and cycling with many paths to choose from. The Settle to Carlisle railway runs through the valley and occasionally steam trains can be seen on this line. The River Eden meanders through the valley with its source at Mallerstang in the Pennines near the North Yorkshire border to the Solway Firth at Carlisle. The River Eden is one of only a few rivers that flow northwards and along with many tranquil riverside walks it is one of the finest salmon and trout fishing rivers in the north of England. Kirkby Stephen is a small market town and is a centre for several smaller villages in the surrounding area such as Nateby, Ravenstonedale and Mallerstang. The River Eden passes by Kirkby Stephen almost hidden from view on the eastern edge of the town. Frank’s Bridge is a 17th century corpse lane bridge and there are stones at the far end where the coffins could be rested on their way from Hartly or Winton. The houses around Frank’s Bridge are the converted brewery buildings. A community and council centre in the library provides general and local information and facilities of the surrounding villages. There is also a Tourist Information Centre, a good range of shops, cafes, pubs and restaurants. St. Stephen’s Church just off the Market Place is often called the Cathedral of the Dales and is the second largest in Cumbria. The Monday Market has livestock sales at the Mart on Faraday Road and stalls on Market Square. St. Luke’s fair or Charter Day is celebrated every year at the end of October and also around this time, is the special Tup sales which are important in this sheep rearing area. Kirkby Stephen is a great base for walking in the Eden Valley and the Yorkshire Dales, as the town is situated on Wainwright’s Coast to Coast Walk. Each June there is the Mallerstang Horseshoe and Nine Standards Yomp which is a strenuous route along the high ground of both sides of the dale of Mallerstang, Wild Boar Fell and the summit of Nine Standards Rigg. 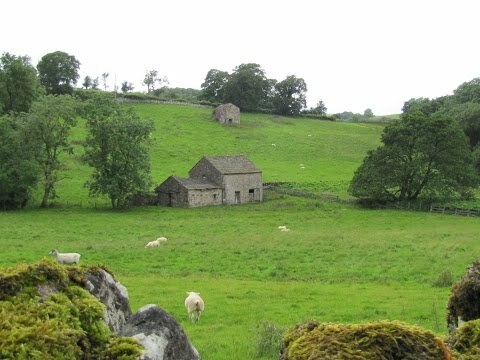 As well as the fell walks there are many lower level walks around Kirkby Stephen through valleys, farmland, woods, along rivers by waterfalls and on disused railway lines. The Northern Viaducts Round, a walk at the southern end of Kirkby Stephen, follows over a mile of the former Stainmore Railway crossing the Merrygill and Podgill Viaducts. It is a permissive right of way, owned by the Northern Viaduct Trust, and is accessible to wheelchairs, pushchairs, cyclists and horse riders for more information contact the Tourist Information Centre on 017683 71199. The disused line coincides in part with the Poetry Path, no disabled access, where there are 12 large stones inscribed with poems reflecting a year in the life of a hill farmer. A leaflet with the text of the poems can be obtained from the Tourist Information Centre. Nateby is a small village not far from Kirkby Stephen and the River Eden and is situated on the boarders of the Yorkshire Dales and North Yorkshire. It houses the Black Bull Inn, a garage and petrol station and a small metal yard owned by families resident in the village. The Black Bull is only a ten minute walk by road from Kirkby Stephen serving hearty Traditional English and Italian food with fresh stone baked pizza to eat in or Take-away. It is an Olde Worlde pub with five comfortable en-suite rooms on a B&B and DB&B basis and during the winter months there are special discounted rates. We park in the free car park and turn right and right again into the town. At the Market Square we turn left past the church and walk down the little road next to the newsagents. We walk by the toilets and follow the sign for River Eden and Frank’s Bridge down an alley way called Stone Shot. We walk downhill turn right and then left down the steps. At the bottom of the steps we turn left to go over Frank’s Bridge and then turn right along a grit path passing an area with seats to a gate. We go through the gate and turn right at the sign for Pod Gill and follow the River Eden on our right towards the barn in the distance. After the barn we walk to the trees in front of us and take the gate on the left to cross a footbridge over a beck coming in from the left. We follow the path through the trees and then at a crossing of paths we head forwards with the wall on our right. We come to a footbridge with a small waterfall and a large stone inscribed with a poem in strange writing on it. We keep heading forwards, passing a few more poem inscribed stones, and cross over a railway bridge and turn right. We head forwards until we come to a bit of a stream over the path in front of us and turn left up the grassy path just before the stream. We pass a farm then at the end of the path we come to a road with a ford on our right we turn slightly left to take a small stone bridge and turn right along the road towards Nateby village. We take the little stone track on the left, at the back of the houses, to bring us onto the main road where we turn left to pass the pub and garage and head forwards on the Hawes road for a short way and turn right at the 30mph road sign and footpath sign to Wharton Hall. At the end of the wall we come out into an open field and head forwards towards the river. We go through the gate and head downhill to go through another gate and make our way to the bridge we can see in front of us slightly to the left. After crossing the bridge we head forwards uphill to a concrete track (which leads to Wharton Hall) and turn right following the sign for Stenkrith through the gate on the right with a yellow arrow. We walk across the field go over two stiles into the next field and head towards the trees in front of us. Keeping to the top side of the trees on our right we come to a stile in the corner. We go over the stile and then almost immediately go over another stile on the left. We head forwards following the river on our right until we come to some steps. We go down the steps to a path with railings next to the river and a waterfall and follow the path round to Stenkrith Bridge. At the road bridge we turn left on the road for a short way and then right through the gate at the footpath sign opposite the Kirkby Stephen sign. We follow the path to a view the waterfall from above and then turn back and take the little path on the right downhill at the side of the fence with an information plaque. At the bottom we turn right and follow the path close to the river on our right heading over a field, through a gate and another field until we come to a footbridge we turn left here and walk up the track to the road. We now turn right on the road back to Kirkby Stephen. This is an easy walk with a few moderate inclines and declines following the River Eden through fields and along paths and tracks with gates, stiles and footbridges. Approx 4.24 miles allow 1 hour 30 minutes using OS map OL19, Howgill Fells and Upper Eden Valley. Kirkby Stephen is in the Eden district of Cumbria. From the A66 take the A685 for Brough. Kirkby Stephen is approx 5 miles from Brough. There are public toilets, including RADAR, in Kirkby Stephen, just off the Market Place. For refreshments in Kirkby Stephen there are plenty of shops, cafes, pubs and restaurants. In Nateby, there is one pub the Black Bull Inn and a garage/petrol station selling ice creams.